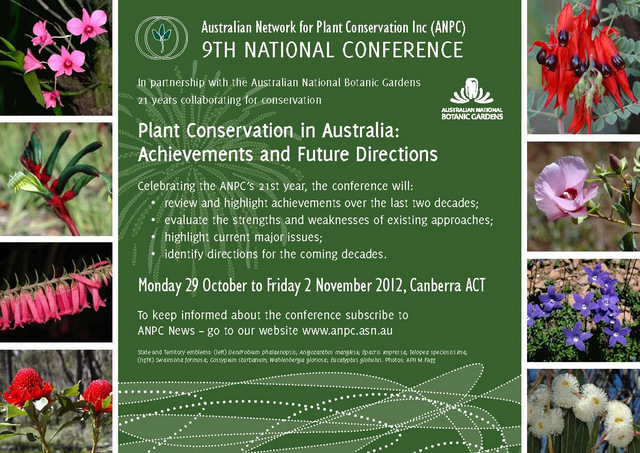 Planning for the 9th ANPC National Conference is progressing and registrations will open shortly. and identify plant conservation directions in Australia for the coming decades. Further information available from the conference website. We are seeking articles for the June – August 2012 issue of Australasian Plant Conservation (APC), the bulletin of the Australian Network for Plant Conservation. The issue will be on the theme ‘Bushland Restoration’ and will highlight current small scale efforts and local approaches towards the restoration of bushland areas. If you, your group, or organisation, has been undertaking bushland restoration, we encourage you to submit an article. What are your visions and goals? What were your challenges? What have been your successes? What has worked really well, and what wouldn’t you repeat again? Articles generally should not exceed 1200 words and authors are encouraged to submit two or three high resolution images to illustrate their article. Further guidelines for authors about the APC style and scope can be downloaded here. General articles not on the theme are also welcome. We also welcome: book reviews; notes regarding interesting recent publications or resources; and workshop, course and fieldwork announcements. If you are intending to submit an article or wish to discuss possibilities, please contact the editor, Selga Harrington by 20 April. Email at selga.harrington@gmail.com. Your final article must be submitted to Selga by Friday 11 May 2011. ANPC WORKSHOP REPORT: What happened at the Canberra ACT Translocation of threatened plants workshop? 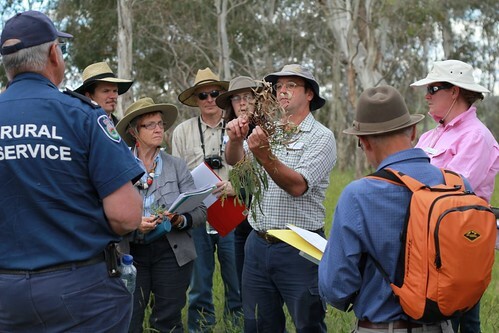 The ANPC’s recent two day workshop on the Translocation of Threatened Plants, held in Canberra 27th and 28th March, was attended by around 40 participants from the ACT, NSW and Qld. 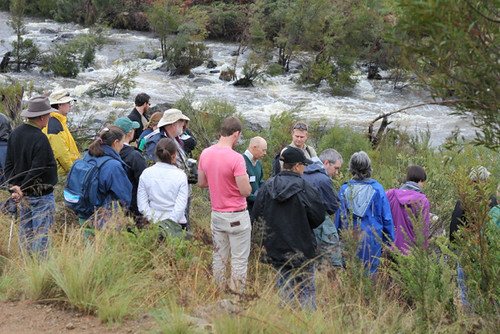 Participants enjoyed a range of networking opportunities and left with a sound understanding of the role of translocation in the conservation of threatened plants. Viewing a translocated population of the endangered shrub Muehlenbeckia tuggeranong — Tuggeranong Lignum. View a detailed workshop report. Additional workshop photographs can be found on the ANPC's new Flickr page. Interested in attending a future Translocation Workshop? A Sydney Workshop has been scheduled for 5th & 6th November 2012 and a Brisbane workshop will happen in early 2013. Subscribe to ANPC News to be notified when registrations open. The ANPC has a new Flickr photo sharing page where you can view pictures of ANPC activities and events. Images from the recent Canberra Translocation workshop and last years' Guyra Jewells in the Landscape workshop are available. Dave Carr teaching plant identification at South Guyra TSR during a 2011 Jewels in the Landscape workshop. Given that this year is ANPC's 21st anniversary we'd like to collate photographs from the past 21 years. Do you have any images of past ANPC activities that you are willing to share? If so, please contact the ANPC National Office. The National Wildlife Corridors Plan Advisory Group has prepared a Draft National Wildlife Corridors Plan. The draft plan lays the foundation for a new, collaborative, whole-of-landscape approach to biodiversity conservation that is based on voluntary cooperation and the existing efforts of communities, landholders, governments and industry. Submissions on the Draft National Wildlife Corridors Plan are now open with comments due by 20 April 2012. The NSW Government released two draft Strategic Regional Land Use Plans on Tuesday 6 March 2012, along with its draft Code of Practice for Coal Seam Gas and a Draft NSW Aquifer Interference Policy. The draft land use plans relate to the Upper Hunter and New England North West regions. These plans are part of a package of strategic regional land use initiatives designed to reduce land use conflict between the mining/CSG industry and other land users. The public is being invited to comment on the draft plans which will be on public exhibition for eight weeks until Thursday 3 May 2012. All four documents, and an online discussion site, are at http://haveyoursay.nsw.gov.au/regionallanduse. Go Green Grants of up to $5,000 are available to schools and groups to support innovative projects that bring about education in environmental issues, focus on sustainability, promote recycling initiatives or help improve the school’s or local area’s natural environment. Applications close 1st May. The NSW Environmental Trust Environmental Education program supports educational projects or programs that develop or widen the community's knowledge of, skills in, and commitment to protecting the environment and promoting sustainable behaviour. The Trust is calling for Expressions of Interest to the Education Program. EOIs close Friday 20 April 201. Grants from $2,000 to $20,000 are available for suitable natural resource management projects under the Local Grants 2012 Program. Individuals, groups and landholders in the Territory are invited to submit applications for funding towards on-ground works which will benefit the natural environment. Applications close Friday 13th April 2012. Fungi Festival 2012 is organised by Fungimap and NRM South and aims to bring information and enthusiasm about fungi to a wide audience. The festival includes a symposium, debate and workshops and forays. This Symposium is the first in Australia dedicated to the topic of conservation and management of fungi. Experts from around the country will speak on the diversity and roles of fungi in the environment. There will also be talks and discussion about the current status and future prospects for conservation of fungi. On Friday morning, presenters will focus on fungi in management and restoration of bushland. On Friday afternoon, there will be guided walks in Queen’s Domain and Royal Tasmanian Botanical Gardens to discuss issues around management and conservation of fungi in the field. Experts on fungal poisoning face off against food enthusiasts to debate this important topic, over a three course meal at The Old Wool Store Apartment Hotel in Hobart. A range of forays and workshops for all levels, ranging from a children’s foray to workshops on identification of disc fungi and sessions on fungal photography. For further information please contact: Blanche Higgins (Fungimap Coordinator) 03 9252 2374, fungimap@rbg.vic.gov.au. The SER-Australasia Inaugural Conference will be held in Perth, Western Australia, 28-30 November 2012. The three day conference program will feature restoration topics of global interest, including themes on 'Our restoration capabilities within a changing world'. Abstract submission for contributed oral and poster presentations is now open and will close on Thursday 31 May. The National collaboration of Regional NRM organisation, WWF, Australian Conference Foundation (ACF) and National Farmers Federation (NFF) are hosting the NRM Knowledge Conference in Adelaide from 16 to 18 April 2012. The conference will be valuable for all NRM practitioners in both the community and government sectors. This year's Weed Society of Victoria AGM Seminar: ‘Weedy Interactions: from sub-microscopic to species and communities’, will be held in Melbourne on 19th of April 2012. The Hut Environmental and Community Association Inc (THECA) presents Forum 2012: Connections - Spatial, Social and Temporal Links for Biodiversity. The forum, to be held 26 May 2012 in Pullenvale QLD, will explore the significance of connection issues in restoring and managing biodiversity for the long-term future and sustainability of the South East Queensland region. The theme of the 2012 Qld State Landcare Conference is ‘Paddocks, Backyards and Balconies…Together, making a difference’. This year the conference, to be held 28-30 June, is open to community groups outside the landcare sector, to 'provide fresh insight on how to develop strong, vibrant and sustainable groups'.